You have finally become the boss, and you have valid reasons to feel good about your team. In the first few months of your new position, you have built a team of really good people. You have strong players in every position. You have clearly defined procedures for every part of the business. You have incentive, safety recognition, and bonus programs. And still, something is not quite right. Somehow, there seems to be a sense of unease. You can’t put your finger on it exactly, but you know it’s there. It’s what you wake up at 2 a.m. worrying about. What symptoms are you seeing? What, exactly, is your concern? Sadly, it’s not precise, neatly defined situation. It’s the little things. Like having to spend too much time monitoring your workers – checking time sheets, correcting behavior problems, and dealing with attitude problems. Many people seem to be “doing their own thing” instead of being a part of a team. If you are like many business leaders, you can relate to this situaiton because getting optimal team performance is a common problem for business owners. It’s a problem for the largest corporation and the mom and pop business. Putting strong players on the team supplies the foundation for good performance, but that is only part of the process. As the manager, you need to encourage behaviors that create positive business results. A powerful tool for encouraging these behaviors is the use of targeted positive reinforcement within a well defined performance management system. Many people have written many articles, reports, and books about the use of positive reinforcement. Still, many managers and business owners wrestle with how to apply the concepts appropriately. One reason many people do not get the results they hope for is a misunderstanding of how reinforcement strategies really work. Positive reinforcement strategies are far more than “pats on the back”, “atta-boys”, and “warm fuzzies.” The effective use of positive reinforcement strategies in a structured performance management system relies on knowledge of your business systems, understanding the effect of specific employee behaviors on business results, and precisely targeted behavioral reinforcements. Creating the performance management system that applies the principles effectively starts with understanding why people do what they do. One model of explaining human behavior says that an individual’s behavior results from the consistent pairing of situations or events just prior to our behaviors and the consequences (experiences, situations or events) created by our behaviors. I will probably write more about this specific issue later. For now, let’s look at an example to quickly and simply illustrate the point. We enter a dark room and flip the light switch to “On”. We do this because we expect light to be the result. Darkness is the antecedent. Light is the consequence. If we enter a room and consistently get no light by flipping the switch, we resort to some other behavior (light a candle, carry a flashlight, etc). This concept can sound simple enough in the example. In practice, it is often more difficult to practically apply it in the workplace. 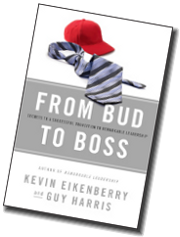 The key to making the principle work to inspire high-level behaviors is to clearly identify the workplace behaviors that produce the desired business results, and then to create consequences for employees that will reinforce those behaviors. Any consequence that encourages a behavior to repeat is a positive reinforcement. But there is a subtlety in application that is very important to understand. We can encourage behaviors. We cannot enforce them. Many companies try to enforce appropriate behaviors rather than working to encourage them. The effort to enforce behaviors requires a high degree of supervisory input and nets only minimal standard performance from employees. Finding ways to encourage high-level behaviors requires minimal supervisory input once the system is in place, and it usually results in superior performance. Identify the behaviors that create the desired results. Measure the results of the behaviors. Positively reinforce the effective behaviors. Evaluate the choice of behaviors and measurements. Iterate to improve selection and definition of desired behaviors and paired consequences. As business people, we all know that human behavior drives business results. Our daily behaviors create the results that either help or hurt our businesses. Learning to encourage behaviors that grow the business can make the difference between success and failure. Well delivered and thoughtful praise can deliver the energy that pushes a team to great performance. Likewise, careless criticism and correction offered without balance can kill a team. Effective leaders learn to choose the right words — either positive or negative — for every situation. Many of my clients are in significant leadership roles. They generally come to me because they want outside perspective to help them grow as leaders or to improve their team environment. Some are not yet leaders. They want to develop leadership skills in preparation for advancement. Awhile back, one of my clients in the second category had an experience that almost destroyed a good working relationship. Leaders and prospective leaders everywhere can learn from his experience. He is a hard-working, driving leader. He fully devotes his energy to his work. He gives extra time to make sure that he is a positive contribution to his organization. And, like most people, he has some blind-spots and imperfections. Overall, he brings far more positive influence than negative energy to his team. Still, he found himself on the receiving end of a disciplinary discussion with his supervisor. In reality, every story has two sides, and this one is no different. His supervisor had a perfectly valid point, but it grew to be far more negative than necessary because of the way his supervisor presented it to him. In just a moment, I will describe the employee side of the issue and how that perspective impacts team performance. Aubrey Daniels, a highly respected behavioral analyst and author, states that high-level team and individual performance only comes as the result of positive reinforcement (praise, rewards, time-off, etc). Anything negative (punishment, penalty, criticism, correction, etc) will, at best, create “minimal effort.” The reasoning and data to support this statement lies beyond the scope of this article. You can read more on the topic in Bringing Out the Best in People by Aubrey Daniels or Whale Done by Ken Blanchard. Very few leaders move smoothly through their careers without having to discuss negative performance issues with their team members. Sadly, many leaders fail in this effort when they confront negative issues in a formal and threatening manner and then do little or nothing to recognize the counterbalancing positive contributions of the employee. I understand how leaders fall into this trap. I see the same behavior in many situations: parents correcting their children, teachers disciplining students, and supervisors discussing performance issues with employees. The problem might look different in different organizations and contests. And still, regardless of the environment, the outcome comes down to the same root problem — most of us find it easier to notice what people have done wrong than what they have done right. Getting back to the person mentioned above. He is committed and dedicated. He works hard. He produces results. And, he has a persistent negative behavior trait — a trait he was already working to improve upon. The first time his supervisor mentioned the behavior, they chose to go directly to a formal reprimand without any prior discussions. When this supervisor mentions positive contributions, they do so casually and informally. The rarely document positive contributions. In this case they went straight to the formal documentary process without so much as a warning. In this case, the supervisor has “motivated” the employee to invest only enough effort to avoid future troubles and confrontations. The employee’s desire to make a major positive contribution is, at least temporarily, gone. I understand the need to use formal disciplinary processes. However, I do not recommend, except in extreme situations, that leaders implement them at the first sign of a problem. I recommend that leaders start the process with performance coaching and informal discussion to help the employee see the problem in their behavior. If the behavior is extreme, or if these coaching efforts fail to improve performance; then, leaders should apply more formal approaches (official verbal reprimand, written reprimand, etc.). Formal approaches tend to feel very negative from the employees perspective no matter how much leaders soften the language they use in delivering the message. When leaders resort to formal approaches too early in the process, they first have to overcome the negative feelings before they can get back on a positive relationship basis. Leaders must confront negative behaviors, and they must create hope. They should confront negative behavior quickly. And, they should look for ways to praise and reward positive behaviors as well. In an ideal world, employees who contribute more positive than negative to an organization will receive at least four positive comments for every one that is negative. Highly effective leaders consciously work to provide at least four times as many positives as negatives so that they can inspire high level rather than bare minimum performance in the teams that they lead. …show up on time?” etc. I also hear all kinds of answers. Some of them are good, and some are not. The good ideas show a pretty good knowledge of human nature and an effort to positively apply the principles of human behavior and interaction. The bad ones tend to feel good to the manager, but they violate some basic principle of human relations. The short answer is: you don’t. They will choose to do what they want to do. You cannot make them do anything. You can alter the consequences they experience as a result of their behaviors. You can modify your communication strategies to improve the odds that they hear and understand your intended message. You can, and probably should, do all of these things to improve the odds that they will cooperate and take the desired action. You cannot make them do anything. They have to make the choice to do whatever they do. With that foundational idea out of the way, let’s get on to the five Be’s. Even though how people behave is a fairly complex subject, events that often appear to be random, isolated behaviors typically fit into relatively predictable patterns for most people. If you understand the patterns, you will know what to do most of the time. To aid in the process of applying these principles, I created the Five Be’s of Motivation to make the patterns easier to remember and apply. People generally do things for one of two reasons: to avoid pain or to pursue pleasure. As a manager, you constantly work between these two options. If you rely too heavily on negative consequences – like verbal reprimands, threats, or other punishments – to drive behavior, people will do just enough to avoid the pain. You will continue to get the bare minimum effort from your employees despite your hard work, pushing and prodding. If you focus on rewarding good behaviors with positive consequences for your employees, you greatly improve the likelihood that you will get cooperation and extra, discretionary effort rather than conflict, complaints and bare minimum performance. Simply noticing and pointing out unacceptable behaviors and stopping them with punishment is easy. It takes real, concentrated effort to recognize good behaviors and praise them. Overall, you need to do both. You just want to find more ways to recognize the good so that you are less likely to see the bad. Make sure you speak only about specific behaviors and avoid comments implying that you understand other people’s intentions. Sometimes you will need to discipline people, and other times you will offer praise. In either case, the more specific you make your words the better. When you get emotionally involved (angry) from a negative situation, you may have a challenge finding ways to state what you see in highly specific language. For example, let’s say that one of your employees frequently confronts you in departmental meetings. Many people will get angry with the situation and say something like “stop being rude and inconsiderate.” Sadly, “rude” and “inconsiderate” are your interpretation of the behaviors. They are not actual behaviors. A better statement would be, “I don’t appreciate it when you interrupt and challenge me. I see those behaviors as rude and inconsiderate. I won’t do it to you, and I don’t expect you to do it to me.” (I suggest you do this in private.) Depending on the situation, you might take further disciplinary action based on company history and workplace rules. Whether you take further action or not, focus on specific behaviors and not interpretations. Rude, inconsiderate, disrespectful, arrogant, obnoxious, flighty, unfocused, smart aleck, and pushy are interpretations. Interrupting, rolling eyes, speaking loudly (or softly), shrugging shoulders, looking away, walking away, and tone of voice are specific behaviors. People generally choose their behaviors (often subconsciously) based on what they expect to happen to them in the future as a result of their behavior. Whether it’s avoiding pain or pursuing pleasure, it’s still about expectations. Your employees need to know – without a doubt – what to expect from you based on their actions. Make sure that everyone clearly understands the rules of conduct in your workplace. Ideally, you will write down anything that is mission critical to your operation. I don’t suggest that you make your employee handbook look like the Code of Federal Regulations, but you should have a few well-written and clearly defined behavioral expectations for your organization. People need to know the rules. They need to know what to expect when they follow the rules – and when they don’t. Consistency works in close partnership with Certainty. It is Certainty’s twin in the daily struggle to create a high-performing, results-oriented team. If you don’t consistently apply your workplace rules, your employees will never develop a sense of certainty. Consistency applies to both positive and negative behaviors. If you say that you will reward certain behaviors, then always reward them. If you say that certain behaviors are unacceptable, always act to stop them. Act as close the observed behavior as possible. When your employees do something worthy of praise – do it now. When they need correction – do it now. Delayed consequences have very little impact on behavior. I’ll illustrate the point with my behavior. I like cheesecake. Eating cheesecake offers me both immediate and future consequences. The future consequence is negative – I could develop a weight or blood pressure problem. The immediate consequence is positive – it tastes good and gives me pleasure. When I have the opportunity to get cheesecake, I find it difficult to resist even though I understand the negative consequences. Why? The immediate, certain positive tends to overshadow the future, possible negative. Acting immediately has an added benefit when the behavior is inappropriate. If the behavior continues without correction, you are likely to get even more angry every time you see it. As you get more and more angry, you will probably find it more difficult to keep your response proportional to the behavior (i.e. – not blowing your stack). Act now and you will be better able to maintain self-control. Remember and use these five “rules” of motivation, and you will greatly improve the odds that people will bring their best and most productive behaviors to work with them. Help for new leaders transitioning to leadership, and for leaders helping others transition to leadership. Can work and home DISC styles be different? Does Your Personality Style Change Over Time?